After a report in Sport this morning, which claimed Barcelona are already looking for a replacement for Thiago Alcantara, more evidence appears to have emerged suggesting the Spain Under-21 star is heading to Manchester United. Barcelona appear to have dropped Thiago Alcantara from their new kit advertising campaign that appeared on their official Instagram account and in magazines across Spain. 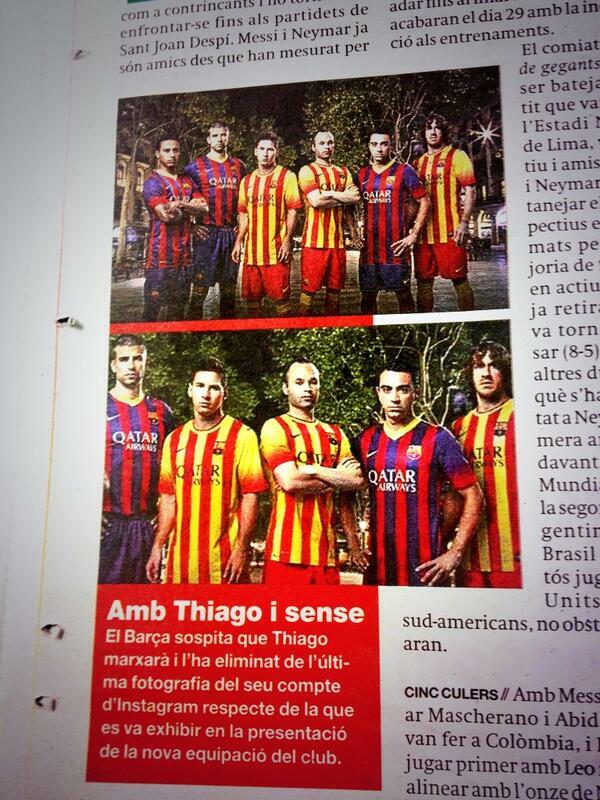 Originally, Thiago Alcantara was pictured alongside Gerard Pique, Lionel Messi, Andres Iniesta, Xavi and Carles Puyol when the new Barcelona 2013/2014 kits were announced. Now, in a sign that Manchester United could well be closing in on signing Thiago, the midfielder has been removed from the advertising. A simple crop of the furthest player on the left (Thiago) has tongues wagging in Spain amid suggestions that the Barcelona midfielder’s move to Manchester United is imminent. Sport add that it could simply be a “coincidence” that Thiago was removed but with fellow suggestions that Tito Vilanova has tried and failed to convince Thiago to reject the advances of Manchester United, this is not a great sign for Barcelona fans.